· Obsidian is a naturally occuring volcanic glass. Obsidian glasses vary from a pure jet black, to a scintillating gold or silver color. The Aztecs wore exquisitely carved obsidian ear-expansors, septum’s, and labrets three thousand years ago. 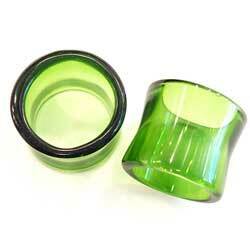 · Obsidian eyelets are extremely fragile!!! When storing your jewelry we recommend putting it in a well padded container.